Mount Vernon Memorial Highway, the first section of the George Washington Memorial Parkway, opened in 1932, the bicentennial of the birth of the man who shaped the nation as peerless leader in the War for Independence, chairman of the Constitutional Convention, and first president of the United States. Planned to connect Washington, DC, the capital city whose location he had selected, to Mount Vernon and the Great Falls of the Potomac River, the parkway passes over the same land Washington frequently traveled on horseback. The last section of the George Washington Memorial Parkway opened in 1968 after many delays. The beautifully landscaped road, almost 40 miles long, is one of the nation’s premier parkways. With views of the broad Potomac to the south and the rugged Potomac Palisades to the north, the parkway provides a scenic entryway for visitors to the nation's capital. Here, you can learn about the first president and the development of America and experience a variety of park sites. Many visitors made the pilgrimage to Mount Vernon during George Washington’s lifetime, and by the 19th century, his plantation had become a tourist “Mecca.” Magazines and tourist guidebooks promoted the journey as a patriotic pilgrimage that would improve visitors’ character and strengthen the nation by fostering greater appreciation for the ideas, events, and values of the early republic. At the turn of the 20th century, an electric trolley line replaced the steamboat as the most popular way to visit the great American hero’s home; both allowed for a scenic journey with stops for picnics along the way. The first automobile tourists arrived at Mount Vernon in 1904, and by the mid 1920s, sightseers congested the hazardous, poorly maintained roads. Billboards, gas stations, and other unsightly developments detracted from the drive. Planning for a highway "of noble proportion," linking the capital with Mount Vernon began as early as 1887-88, with the chartering of the Mount Vernon Avenue Association. Lt. Colonel Peter Hains of the United States Army Corps of Engineers surveyed a number of possible routes and described his vision in a report to Congress, "It is to commemorate the virtues of the grandest character in American history... It should have the character of a monumental structure, such as would comport with the dignity of this great nation in such an undertaking, and the grandeur of character of the man to whom it is dedicated." The project encountered setbacks at first. The 1902 Senate Park Commission or McMillan Plan provided support by recommending the building of a highway from the planned Arlington Memorial Bridge to Mount Vernon. In anticipation of the bicentennial of Washington’s birth in 1932, Congress directed construction of a “suitable memorial highway” under the auspices of the Bicentennial Commission. Charged with its design and completion, the Bureau of Public Roads began building the highway in 1929. Well-known landscape architects, Frederick Law Olmsted, Jr., Charles W. Moore II, and Gilmore D. Clarke helped create one of the nation’s earliest and finest scenic highways, the first with a specific commemorative purpose, and the first built by the Federal Government. In 1930, while the Mount Vernon Memorial Highway was still under construction, Congress passed the Capper-Cramton Act authorizing creation of the George Washington Memorial Parkway. The parkway was to include the earlier Memorial Highway and extend it to Great Falls creating a long regional park on both sides of the Potomac. Beginning in the 1800s, the Great Falls of the Potomac were a popular tourist attraction. 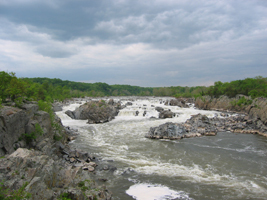 In the 1920s, stone quarrying and plans for hydroelectric dams threatened to destroy the natural beauty of the Great Falls and Potomac Palisades. Senator Arthur Capper and Congressman Louis C. Cramton lobbied for the preservation of this unique natural and historical landscape, and aroused public sentiment by linking saving the area to the awe-inspiring name of George Washington. Great Falls was closely associated with Washington’s dreams for the new nation he had helped create. He saw the Potomac River as a future channel of commerce connecting the Eastern Seaboard to the lands west of the Allegheny Mountains and uniting the nation through improved trade and transportation. The most serious obstacle to making the Potomac navigable was the Great Falls. In 1784, Washington convinced the assemblies of Virginia and Maryland, which bordered the river, to establish a company to improve navigation on the Potomac between its headwaters near Cumberland, Maryland and tidewater at Georgetown. Organized in 1785, the Patowmack Company had directors and subscribers from both States; George Washington was president and presided over the project until he went to New York to accept the office of president. The greatest engineering challenge was the construction of a canal and locks on the Virginia side of the river to bypass the Great Falls, where the Potomac drops nearly 80 feet in less than a mile. Hired hands, indentured servants, and slaves blasted the southern end of the narrow canal through high rocky cliffs by using only black powder creating an engineering marvel of the day. Although George Washington did not live to see the canal completed, he often visited the project to inspect its progress. Many boats used the canal to bypass the falls, but it was never profitable and was abandoned in 1830. Building George Washington Memorial Parkway was a technical challenge. It also required close cooperation between the National Park Service, which administered the parkway beginning in 1933, and a variety of federal, state, and local agencies, including the Bureau of Public Roads, the National Capital Park and Planning Commission, Maryland National Capital Park and Planning Commission, and the Commission of Fine Arts. Chronic shortages of money slowed construction, which lasted off and on for almost 40 years. Most of the parkway on the Virginia side of the river opened in 1965, the final section in 1968. Conservationists, who opposed highway construction in scenic or historic locations, ultimately prevented the planned extension of the parkway to Great Falls. In Virginia, construction ended at the Washington Beltway. On the Maryland side, the parkway was partially completed between Chain Bridge and Carderock, just north of the Beltway. The Maryland parkway had its name changed in honor of Clara Barton, founder of the American Red Cross, whose home now a unit of the National Park System, is located nearby. The historic and natural resources of the area would likely not have survived without the George Washington Memorial Parkway. Colonial-style signs and memorial trees and tablets mark numerous places to see, enhancing its roles as scenic drive and commemorative highway. A bronze tablet at the Mount Vernon terminus commemorates the parkway’s completion. There is much to see and do along the parkway. In addition to the places associated with George Washington, a wide range of natural areas and memorials, such as the bronze Iwo Jima statue and the monuments that line the approach to the Arlington Cemetery are located along the parkway. For a complete list click here. George Washington Memorial Parkway, a unit of the National Park System, is adjacent to the Potomac River north and south of Washington, DC. Click here for the National Register of Historic Places file: text and photos. The parkway is accessible from all major travel routes from the south and west of Washington, including I-495, I-95, and I-66. Click here for a map of George Washington Memorial Parkway. For more information, visit the National Park Service George Washington Memorial Parkway website or call 703-289-2500. 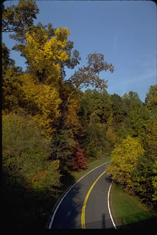 The parkway is designated a National Scenic Byway. George Washington Memorial Parkway has been documented by the National Park Service’s Historic American Buildings Survey.